I'm taking a two-pronged approach to attacking Wethersfield and trying to get it done before the big NER convention this November. At the south end, I put up some temporary mockups for Valley Coal and at the north end, I'm trying to work out the Rt. 15 overpass. In both cases, I could benefit from some more sophisticated mockups. Fortunately, "there's an app for that" - and I got it a couple of Christmases ago: Model Builder Software. 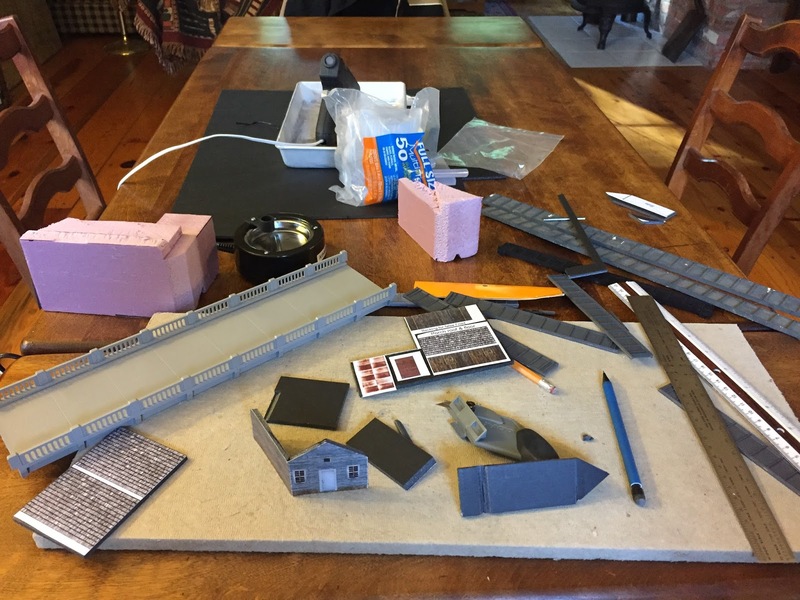 Unfortunately, as is too often the case with some Christmas presents (I have a MicroMark resin casting set I got a couple years ago that I still haven't ginned up the courage to use), I hadn't yet tried the Model Builder software, but this new demand for mockups gave me the incentive I needed. But the Modeling Gods were against me - when I went to get the disc, I remembered I'd loaned it out. Ooops! 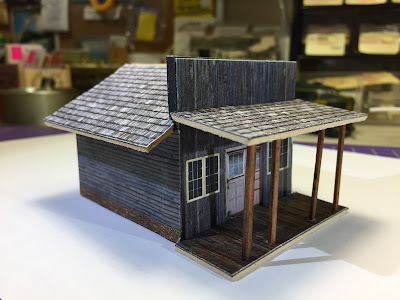 But that was ok - I at least noodled around the Model Builder website and learned a bit about the process of designing and building mockups from cardstock/chipboard/foamcore (see instructions here and a great article here). And - BONUS! - the site has a free, already designed, building "kit" you can download and print to practice. While you can certainly use a regular Xacto knife to cut out the images and the material (be it foamcore or cardstock), I found an Xacto mat cutter very useful in making perfectly vertical and 45 degree angle cuts in the foamcore. There's no real rocket science here - again, it's mostly just becoming familiar with the materials and the process - and following the helpful instructions. I used stained stripwood for the porch roof supports, glued in place with Aileen's Tacky Glue (everything else is put together with hot glue). 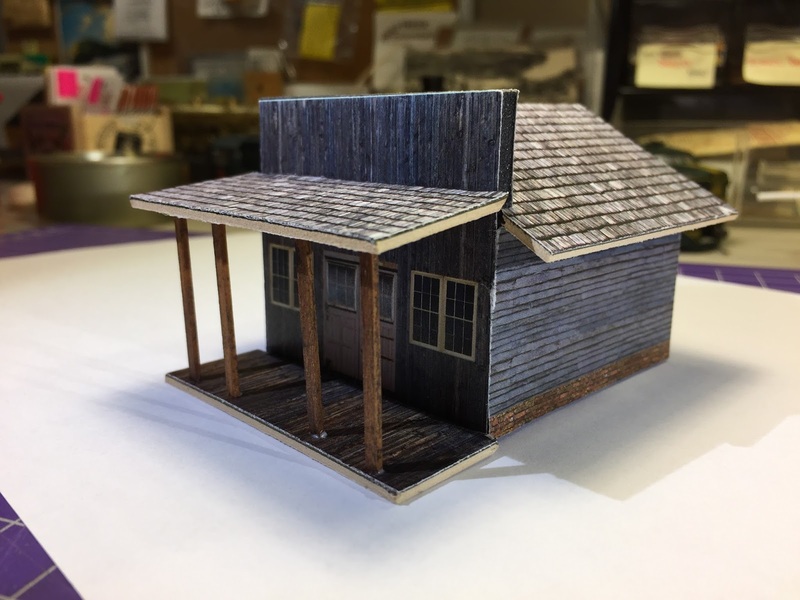 And while the walls are 1/8" black foamcore, the roofs and porch are cardstock for a thinner profile. In retrospect, I should probably have used cardstock for the front/false wall as well - the foamcore is way too thick for that. And that led to a problem - when I first attached the roof (and, yes, I'd hot glued it), it was offset far too far back. It was hitting the thick false front and had WAY too long an overhang at the rear. So, I carefully pried the roof off, and cut in a long notch to allow the roof to "wrap around" the sides of the false front, as you see above. Not a perfect solution, but it looks a lot better than it did. A couple other tips: I used masking tape to attach the two main roof halves together and to attach the porch to the base of the building. The porch and porch roof are held together by the glued-in wood supports. All in all, I'm very happy with how this building came out. Since it prints out already "painted and weathered," all you have to focus on is cutting it out and assembling it. Even with all my trial/error/mistakes/fixes, it only took an (very enjoyable!) evening to do. And it makes a very credible background building - and a MUCH better mockup than a plain box or block of wood. . . So I'm looking forward to getting the software back and trying it out. It includes a WEALTH of different "materials" (brick, wood siding, clapboard, etc) - as well as doors, windows etc - that you can try out. I figure it'll be a great way not only to create some nice stand-in models, but will give me a great guide for what actual 3D scratchbuilding supplies I need for a particular structure. Scroll down a little over half way and look for P/N S71. I hope this information is useful. I'm not associated with this company; just a satisfied customer. Awesome - thanks Tim! I'll definitely check those out. Thanks again for the info - hope you're enjoying the blog!